Alright, it's not solely useful for capturing wipeouts, but that's the selling point of a head-mounted camera, isn't it? Oregon Scientific's ATC2K is a 640x480 video camera that captures footage at 30 frames per second. 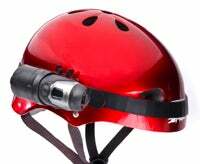 It mounts easily on helmets and handlebars, and is pretty lightweight. Besides 32MB of onboard memory, you can expand storage with SD cards, up to 2GB. Best of all, the ATC2K is waterproof up to 10 feet. The Oregon Scientific rep I talked with showed me some footage of kids in the pool, swimming around underwater with the camera on, and told me that one of the Oregon Scientific execs had just left his at the bottom of his pool for a while, to see how it worked. Works pretty well, it seems. Included USB and RCA cables make it easy to playback your vids on your PC or TV, in either NTSC or PAL formats. Supposedly it's only compatible with Windows, but since it stores the movies as AVI files, you may be able to get around that with the right codecs and pulling stuff off the memory card. Not sure. Hopefully we'll see some Mac support on it soon, for all you extreme underwater enthusiasts. $129.99.